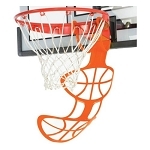 Product: Lifetime 72005 Competition Series Competition Portable Basketball Backboard. Dimensions are 54" x 33" x 1.5" on the Square Clear Shatter Guard Backboard (Now updated to Shatter Proof). 72005 Lifetime portable basketball goals include a 3 piece, 4" Square Black Hammer tone Power Lift? Pole an Orange Slam-it Pro Rim and Wide-Span Rectangular Extension Arms. Lifetime Competition Series 72005 Portable Basketball Systems Include Free Shipping & Handling to 48 mainland US from Competitive Edge Products, Inc.! BONUS! - FREE GIFT CERTIFICATE COUPON TOWARDS ACCESSORIES INCLUDED IN THIS PURCHASE! Lifetimes 54 inch Acrylic Backboard features a pro-glass look and provides superior performance. The steel frame gives added rigidity for improved rebound. The back boards graphics are screen printed with ultraviolet protected inks offering fade resistant color. Play like the pros on this Lifetime portable outdoor basketball system with the high-performance Slam-It Pro Rim. This rim features an arena style wraparound brace, supporting a 5/8 inch ring of solid steel. Welded steel net hook do not require replacement. Double compression springs provide excellent springback action. Built for aggressive play. Lifetimes 3 piece 4 inch square pole is excellent for strong & solid goal support. This 3 piece 4" round pole is protected with a weather resistant coating. Holds 350 lbs. of water or 588 lbs. of sand, base bolts to concrete surface, slide collar has a bubble level which helps to level pole to playing surface, and pole reclines for storage. 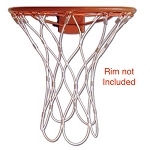 - In Ground Basketball Systems Pole Size: 4" x 4"
We liked that it had heavy duty construction, an adjustable rim height and that it was mobile. This is a very solid unit. It only took about three hours to assemble including filling it with 500 lbs of sand. When you shoot the ball and hit the rim or the backboard, it has a very solid response. Everyone likes playing with it. I have to say that on very windy nights, it has fallen over. If you lower the backboard, it seems to act less like a sail, avoiding the problem. It is hard to move, but you can do it. The wheels are toward the back but should really be in the front. When I had the driveway re-coated, I had to remove the unit and then push it back. I weigh about 180 and am in pretty good shape. Someone smaller or less fit would have a problem moving it. It is worth spending the extra money for this unit. You will not regret it. Dimensions: 55" x 43" x 13"